The fourth Saturday of each month is Guild day. I joined the Ventura County Handweavers & Spinners Guild in June 2005. It's a great group with a lot of diverse interests. One of the things I like best - other than the expertise so willingly shared - is the monthly program and workshop. 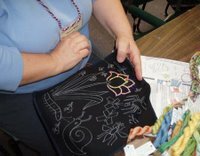 In less than a year, I've attended workshops on spinning, ply-split braiding and tablet weaving, weaving California Rags, tapestry weaving, and beading. 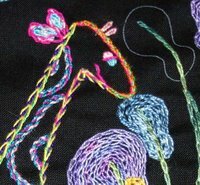 Guild workshops are reasonably priced and the instructors are world-class; every one has been an acknowledged expert in her field. While all have been interesting, and several have been excellent, this past Saturday's workshop was one of my favorites. 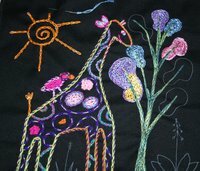 The topic was African Folklore Embroidery taught by Leora Raikin. As usual with these workshops, I had very little idea what I was getting into. Leora is from South Africa and her kits and materials all originate in that country. 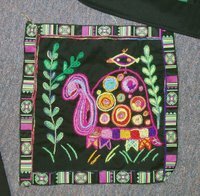 New to the U.S., this type of embroidery is based on the work of Ndebele women and is done on black fabric with brightly colored threads. The stitches are simple but the combination of colors makes each piece striking and original. Leora is an excellent instructor; she's funny, easily keeps your attention and quickly explains key concepts. The materials fee included a full-size kit, unlike other instructors who included only demo-sized materials. Also unlike other workshops, I want to finish my kit, not just put it aside once the workshop ended. The fabric is serged on all four sides so it will be easy to make Elvis into a tote bag or pillow. And if I decide to flake out on sewing, Leora offers a finishing service at a nominal fee. The woman thinks of everything. Maybe that's why I bought two more kits and a handful of the most beautiful variegated yarns. Yeah, that's what I need alright. Another hobby. Can't wait to see it in person. The pictures are so pretty. I LOVED your entry today. LOVED IT! Way to go, you should be very proud of yourself. I'm VERY impressed. I'm so proud of the FANTASTIC job you did with all the information. WOW!!! I'm going to have to blog-lift it to use on my blog site, since my brain isn't functioning these days I can’t enter stuff lately. I also couldn't get enough of it this weekend, but I was looking for some thing to lose myself in. 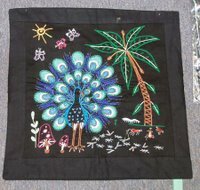 THANK GOD, I had this embroidery to keep my mind busy. It has been a perfect retreat for me during this f’d up time. I can't wait to see yours. I am loving mine. Yippee!!!! Something that helps bring a smile to my face.